The primary focus of GlobeCore is the development and production of transformer oil regeneration equipment. Among the methods of regeneration the most widely used is adsorption treatment. It is particularly effective for processing the oils containing dissolved products of aging. The adsorbent becomes gradually saturated and requires recovery of its properties. Generally, the reactivation process takes 18-20 hours. But not all of our customers have the opportunity to allocate the time for sorbent reactivation, because the same time can be spent to process several tens of tons of transformer oil. Therefore, GlobeCore has developed a new CMM-12R plant which on the one hand performs adsorption treatment, and on the other hand, it works round the clock without breaks for the recovery of sorbent. This year GlobeCore has sold several of these plants. The last commissioning took place on August 25 in Quito (Ecuador). The CMM-12R unit was connected to a transformer without switching the transformer offline. Ecuador is a mountainous country, and the GlobeCore plant had to work in high altitudes, which had no effect on the quality of oil recovery: the results were consistently high. In particular, it was possible to reduce dielectric loss tangent from 11% to 0.7% at 90 ° C, as well as to increase the breakdown voltage up to 80 kV in the first test cycle. The CMM-12R unit is a frame structure that includes a degassing section, a regeneration section and an operator room. The degasser performs filtration, heating and vacuum drying of oil, and the regeneration section performs restoration of oil chemical properties. Also, the regeneration section performs multiple reactivations of sorbent. The operator room has a control cabinet, a desk etc. To get started, the equipment is filled and connected to the transformer via the TSS security system. The next step is to warm up the unit and bleed the air. During regeneration, the oil is pumped through the lower port of the transformer and fed into the degassing section. The degasser filters and heats the oil. The heated oil flows into the regeneration section. After regeneration, the oil reenters the degasser. The degassed oil goes through final fine filtration. Then it is pumped back to the transformer. If you value your time, the CMM-12R unit is for you. 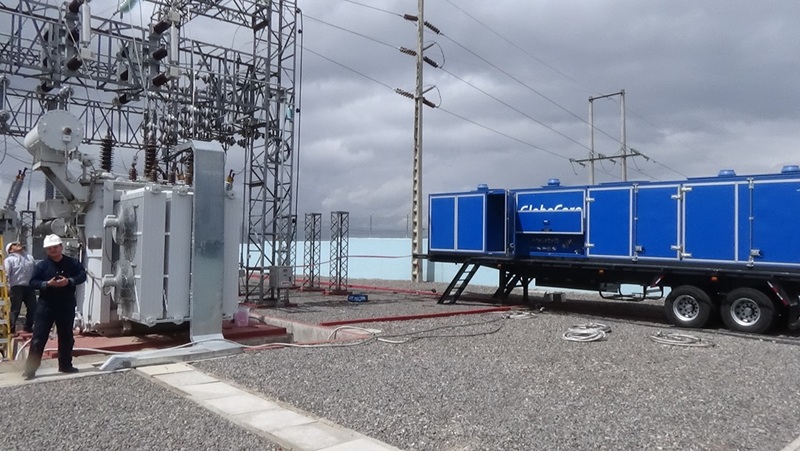 With this equipment you can easily regenerate transformer oil 24 hours a day!